Aluminium Return Air Grille - Please contact us directly on 0161 336 5065 for bespoke products not listed as we specialise in made-to-measure vents and custom designs. Hinged maintenance core secured with thumb screw fasteners. Standard filter frame holds a one inch/25mm filter. Usually available for next day delivery (order by 3pm). Available Size: 550mm x 550mm Opening/Duct Size. 595mm x 595mm Overall Face Size. The CVE Shop Return Air Grille & Filter is the one product which offers complete and simple service ability for all situations. A unique design which can easily be installed. Ideally suited to environments where regular maintenance of the filtration media is a concern, the Return Air Grille & Filter is designed for quick, simple filter changes. 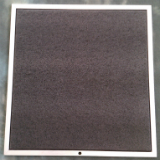 The actual filter pad is a product of exhaustive research by one of the world’s largest air filtration authorities with approval from the American Underwriters Laboratories. A distinct Black coloured filter media shows dirt and particle build-up and provides for ready inspection prior to replacement as required. The return air grille is suitable for use in T-Bar Ceiling Grids and is sized to directly replace a standard 595mm x 595mm suspended ceiling tile. The return air grille with disposable filter media can be made-to-order in sizes other than the standard size listed. Please call for pricing and technical information. The hinged egg-crate core is made from thin aluminium strips arranged into a lattice. The square holes in the core are sized 13mm x 13mm. The external frame is manufactured from 1.0 mm Aluminium to provide a strong and robust housing. Standard finish for this product is RAL9010 White. Also available in Mill (untreated aluminium), Satin Anodised or alternative powder coated colours to suit your requirements - please call for pricing. CVE Shop economy top entry pan adaptors and galvanised steel plenum boxes are available to suit this product. Nominal Dimensions = Opening/Duct Size. This is the number shown in the part codes. CVRAG550: The nominal opening size is 550mm x 550mm. The overall face size is 595mm x 595mm.